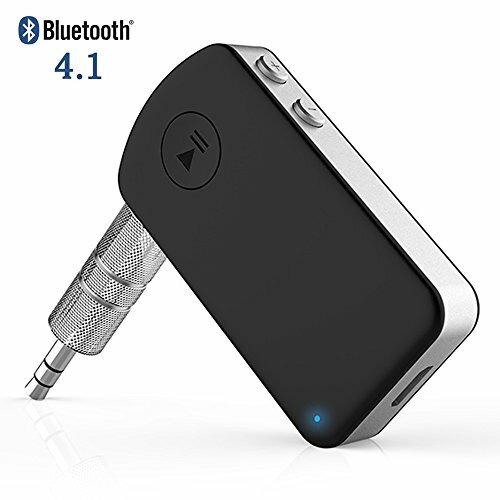 Giveet Bluetooth Receiver, Built-in CSR Advanced Bluetooth V4.1(Best Chipset in the world) that it supports HFP/HSP/A2DP/AVRCP mode, stream high quality audio and Just enjoy a crystal clear sound wirelessly. Turn your non-Bluetooth headphones/Car Speakers to Bluetooth-enabled, just connect the Giveet Bluetooth adapter with your wired headphones by 3.5mm audio cable, then to enjoy your lovely music from your phone wirelessly. Works with All iPhone, iPod, iPad, Android Smartphones, Tablets, and others via Bluetooth. Built-in HD Microphone makes talking to family and friends a breeze. Perfect for hands-free calling when driving. Whether you want to play music or chat to friends on the phone, the receiver gives you the freedom to support Multi-points Dual Link. Ensure low battery consumption, thus allowing you to enjoy up to 12 hours non-stop music, 300hours standby time! And it can work while charging! 【ADVANCED BLUETOOTH RECEIVER】With CSR Advanced BLUETOOTH 4.1 /HFP/HSP/A2DP/AVRCP, you will get higher quality and speed audio sound than the Bluetooth 3.0 or 4.0 version both in playing music and answering calls. The higher version and connection range（up to 33ft） guarantee the transmitter speed and low signal delay. 【DUAL-LINK CONNECTION & WIDE COMPATIBILITY】Enjoy an easy and quick switch between two devices actively connected to the Bluetooth adapter and play music from either smartphone and could compatible with most Bluetooth enabled devices like smartphone, MP3, tablet, and others, ideal for home or vehicle audio systems. 【EXTRA-LONG PLAY TIME】Built-in battery provides up to 12 hours' play and talk time, 300 hours' standby time, only takes 1.5 hours to fully charge it. It can work while charging. 【EASY CONTROL】You can answer phone calls or control music on the receiver. Change volume, play/pause/skip music, answer calls, redial the last called number with ease. 【NOTE】 1.This BTI-030 doesn't turn on automatically, please long press the "MFB" Button about 3 seconds, when it turned on the blue light will flash, then connect it with your Bluetooth devices; 2.If you want to connect to your TV by pairing the device with your Bluetooth Headphones, please search Giveet Transmitter BTI-018 or BTI-029.3.In Giveet, Comes with Full One Year Warranty & Lifetime Satisfaction Support Guarantee. CE/ROHS/FCC Certified.